Cross Platform media center and home theater application Boxee has released its last version for PC. The latest version 1.5 build will be available till January and it will be the final supported version for Windows, Mac and Linux desktops. Boxee is a fork of Open Source media center application XBMC. 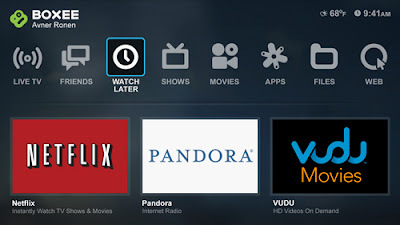 While XBMC is fully open source and is managed by a non-profit consortium, Boxee has added its own custom proprietary additions. The announcement came in a recent blog post and they believe that HTPCs are now things of passé. We believe the future of TV will be driven by devices such as the Boxee Box, Connected TVs / Blu-Rays and 2nd screen devices such as tablets and phones. While there are still many users who have computers connected to their TVs, we believe this use case is likely to decline as users find better alternatives. People will continue to watch a lot of video on their computer, but it is more likely to be a laptop than a home-theater PC and probably through a browser rather than downloaded software. What are your thoughts on this? Do you actually use Boxee on your PC? Personally, I have been using XBMC for quite some time and its great and much more customizable than Boxee. Plus if you really like Boxee interface and want it on XBMC, there are fan made skins available that will make your XBMC setup look like Boxee. There is also a new promising media center application - Media Explorer. It is supported by Intel Open Source Technology Center and is currently under heavy development. Media Explorer is not fully featured as XBMC at the moment but lots of new features are planned for implementation. The latest version was released just 7 days back. Give it a try.